This is the history of the brand Mini since the establishment of the company and up to the most modern of vehicles produced under this brand. 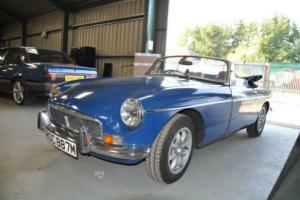 We have collected the best classic cars in our catalogue. In addition, if you're going to buy one - just check the latest Mini listings in the United Kingdom. Legendary British Mini car in its appearance owes much of Egyptian President Gamil Abdel Naser, who in 1956 nationalized the Suez Canal. As a result of the ensuing war in the Middle East oil supplies to Britain declined sharply - to the extent that the gasoline had to introduce the card. This caused a surge of interest in small cars than Leonard Lord decided to use, at the time head of the concern British Motor Corporation. 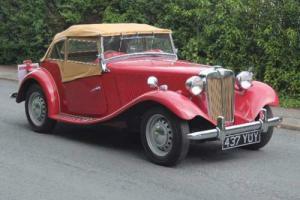 BMC - founded in 1952 by the union, which included such well-known brands such as Austin, Morris, Wolseley, Riley and MG. Unhappy with the dominance of jerry-built "bubble cars" ("machine-bubbles") on British roads, mostly German assembly, Lord decided that we needed a domestic car worthy of attention. He commissioned the development of a new machine Alec Issigonis, an Englishman of Greek origin, who has long established itself as a avtokonstruktor and even the driver. He was given an assignment to construct a four-seater, the size of which would not exceed 3 × 1,2 × 1,2 m, the length of the passenger compartment should be 1,8 m supply this little one had to already existing 4-cylinder engine from the Austin A35 models . To meet these requirements, Issigonis went to a revolutionary step. The new model had a front-wheel drive and the motor is placed across the body - this scheme was to become the standard on front-drive cars. Transmission creators pushed into the crankcase, and the radiator is not put in front of the engine, and the side of it. In this position the radiator ventilation air, already passed by the engine and had time to warm up, but the length of the machine remains within the limits. In the miniature car quietly climbs 4 people and even had room for luggage. The tiny 10-inch wheels are allowed to get rid of the large wheel arches. Finally, for the sake of saving space conventional leaf springs were replaced with conical rubber blocks. The design of machines allowed to drive with the tailgate open, thereby increasing the volume of cargo. Design features have also been external welds and open the hinges, which lowered the cost of production. The first prototype was ready by October 1957. 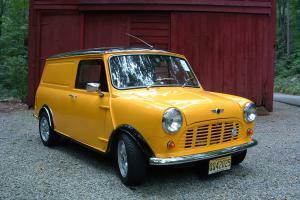 However, sales began in August 1959, and a new minicar was not called Mini. It is sold either under the name of Austin 7 (the traditional name for the smallest Austin since the 20's) or as a Morris Mini Minor. Title Mini has appeared only in 1961. You can not say that the model instantly became a hit, but over time it has gained popularity and became the same for the British than for the rest of the world was the "Beetle". They even say that this particular machine was inspired by the fashion designer Mary Quant, come up with a mini-skirt. Mini was produced in all sorts of varieties. 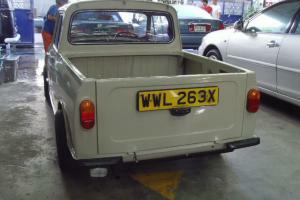 There were wagons with wood trim, called Morris Mini Traveller and Austin Mini Countryman. There were Mini vans and Mini pick-up a quarter of a ton. There was even a Mini Moke, developed for the Army, but with their tiny wheels and without all-wheel drive turned out to be unfit for military affairs, but has received some popularity as a beach car. 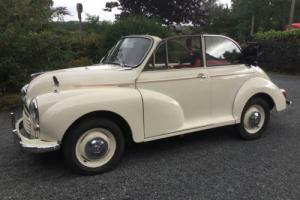 In accordance with the practice of badge engineering got its Mini brand more upmarket Riley and Wolseley - these machines are sold as Riley Elf and Wolseley Hornet and had a protruding boot and the front end design in the style of these brands. There were also licensed Mini: in 1965 they released an Italian company Innocenti, which was under the control of the BMC, and even Mini collected, even in countries as far away as Chile and Uruguay. The design is also not standing still: in 1964, rubber suspension was replaced by a new hydraulic Hydrolastic, which gave the car a more mild stroke, but it significantly increased the weight, cost and complexity. In 1971, it was replaced by the suspension of the former type. Instead, 34-horsepower engine, a 848 cm3, allows a speed of 116 km / h, with 1967 set on the Mini motor in 948 cm3 - a tiny car with him reached the unprecedented speed of 145 km / h But most importantly, successful weight distribution (51% of the weight - front, 49% - on the rear) allow malyutke successfully participate in the rally. John Cooper, owner of the Cooper Car Company, together with Issigonis created the Mini Cooper: this car since 1961, produced under the brands Austin and Morris. 997-cc engine has an output of 55 hp The car has received two carburetors, a box with a modified gear ratio and disc brakes on the front wheels. 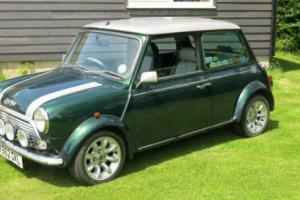 In 1964 he appeared Mini Cooper S, since 1071-cc engine. This model is distinguished in 1964, 1965 and 1967, winning the victory in the Rally Monte Carlo. Mini first generation, which was sold in quantities of 1 million 190 thousand units, ceased to exist in 1967. 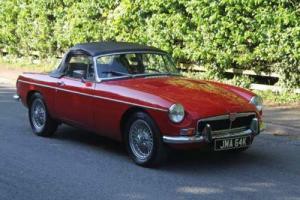 He was replaced by Mini Mk II, are issued in the years 1967-1969 and distinguished grille and some cosmetic changes. In 1969, the Mini Clubman came with a brand new radiator, but parallel to it and continued to produce a model with the traditional "round" design. Mini third generation (since 1970) externally characterized primarily hidden hinges instead of the previous open. Only from that time becomes a brand Mini, another in the extremely overgrown BMC, which after mergers and acquisitions in 1966, became known as British Motor Holdings (BMH). And two years later, in 1968, was renamed the British Leyland Motor Company. At this point, the company included many famous British brands, including Jaguar, Daimler, Rover, Standard and Triumph, in fact, the subjugation of all the English car industry. All this does not matter to her advantage: the more it grew, the more nerazvorotlivoy became, and is not saved even nationalization. Stopping the production of many brands and changing the name again - first at the Austin-Rover Group, and then to the Rover Group, - the concern is, after all, was sold in 1988 of British Aerospace. Aerospace technology is also not able to recover profitability, and in 1994 Rover Group was owned by BMW: Bavarian company at the time assailed ambitions put together their own automotive empire. However, all these shocks has little effect on the Mini: despite the archaic design and construction, it is still loved by the British, even the appearance of a 1980 Mini Metro, which later produced under the name Rover, has not changed the situation. Actually, a non-decreasing popularity of the car and began to BMW one of the main reasons for the absorption of Rover Group. And even when the latter, confounding expectations of BMW, in 2000, moved to a new owner - a consortium of Phoenix, - Mini brand has remained in the possession of "the Bavarian automobile factories." But nothing lasts forever, and after 40 years of production Mini removed from the conveyor. To replace him in 2001, he joined a brand new car design, but kept in their appearance recognizable features of the old Mini. This car was officially named MINI - all caps here is not accidental. They not only point to the fact that we are dealing with a new car, but the fact that she is a class above the previous model. In fact, it's not super-compact car "for the poor", generated by the fuel crisis, and the offspring of good times - a stylish and prestigious hatch with great handling, the design of which exploits the current fashion for retro motifs. Once we mentioned "Bug", we can say that the new MINI Mini refers to the old as well as the New Beetle - the classic "Beetle". The same was said and enlarged several dimensions MINI: the car was a 55 cm long, 30 cm wider and 400 pounds heavier. Wheel size is already a solid 15-17 inches. Under the retro looks are hiding anti-lock braking and traction control system, electronic stability and airbags. The range includes basic Mini One, sports version of the Mini Cooper and "charged» Mini Cooper S with mechanical supercharging, which has become the successor to the legendary Cooper S 60s. In addition, the company offers John Cooper Works MINI in different tuning designs. Since 2004, the issued convertible MINI. In November 2006, there was much new MINI, informally referred to as Mk II and equipped with a new 1.6-liter engine - jointly developed by BMW and PSA Peugeot-Citroen. This model goes on sale in April 2007, and the convertible will be produced from 2008.